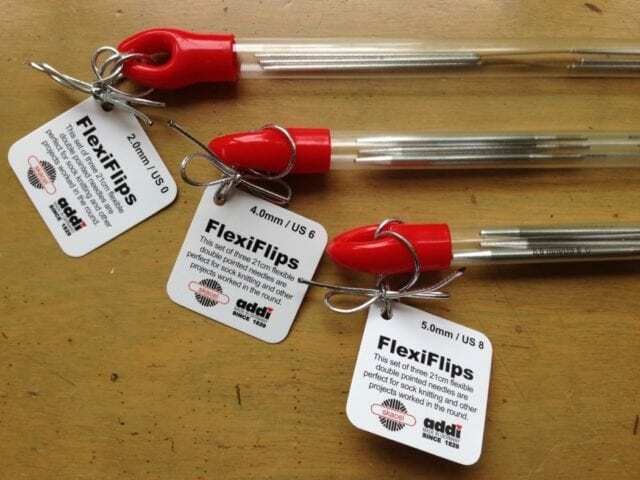 We’re thrilled to have a fresh bouquet of addi FlexiFlips here at the shop! These new needles from addi offer an alternative to double points or magic loop for small-circumference knitting. They come in tubes of three 8″ needles, and the basic strategy is to divide your total stitch count in half between two needles, then knit with the empty third needle. FlexiFlips have been in and out of stock since their debut last fall, on account of their tremendous popularity in our shop and in yarn shops around the world. 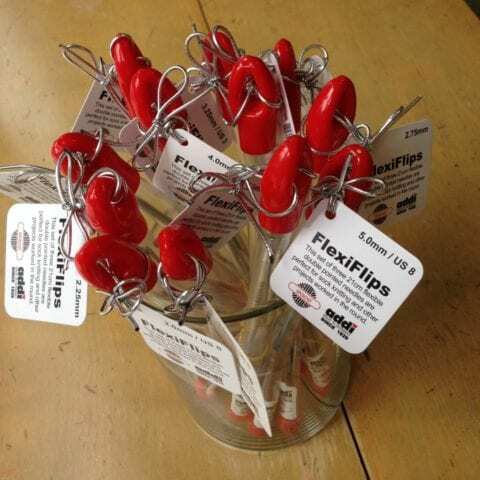 This popularity begs the question: what’s so great about these FlexiFlips? As in so many facets of the knitting world, the answer to this question comes down to preference. 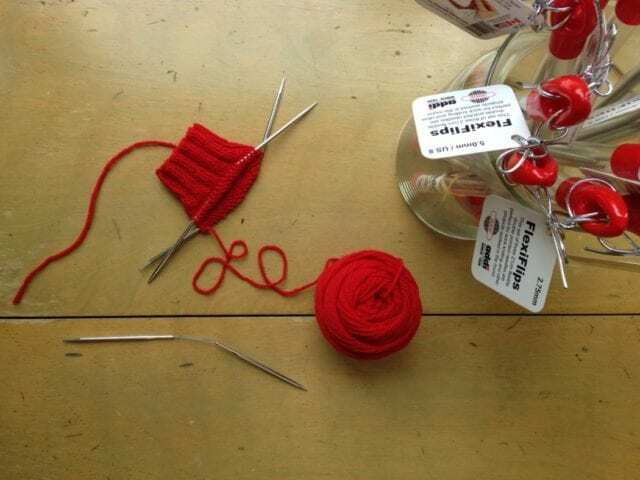 I know plenty of knitters who swore off sock-knitting until they discovered magic loop, just as many who knock out sleeve after sleeve on two circulars, and still more who delight in their double points. That last group is where I reside, so for me, the FlexiFlips are fine – but I’m sticking with my DPNs, because they’re comfortable in my hands and work well for me. Come by the shop to give them a try and see where you stand – we have some Brooklyn Tweed Arbor on the FlexiFlips for you to play with! Knitters have all kinds of preferences when it comes to needles. Smooth, slippery, pointy, blunt, round or square… there are lots of choices, and we try to have a little bit of everything, knowing that these preferences differ from knitter to knitter and from project to project, depending upon what kinds of techniques or fibers are in use. 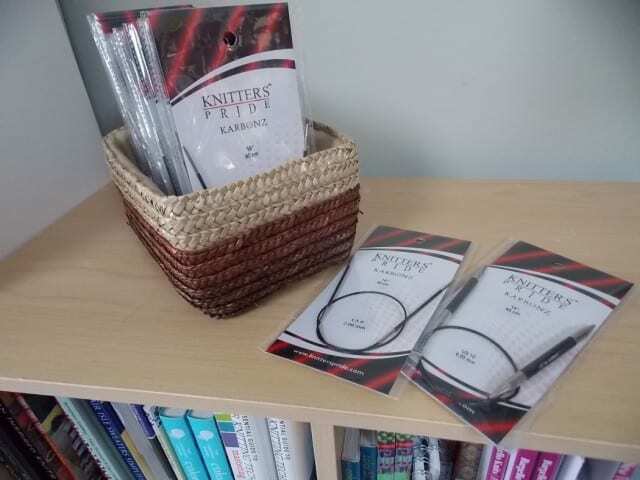 This week brought two shipments of needles and hooks, bringing us as up to date as possible on our supply of those most essential tools for making stitches. 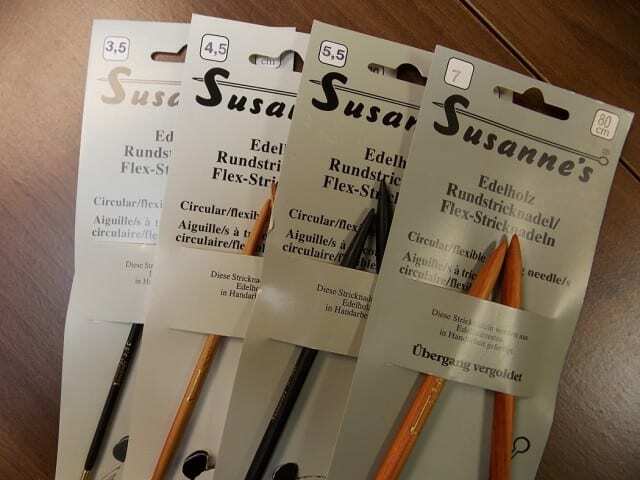 We carry a variety of metal needles from Skacel, including Addi Turbo, Lace, and Rockets. 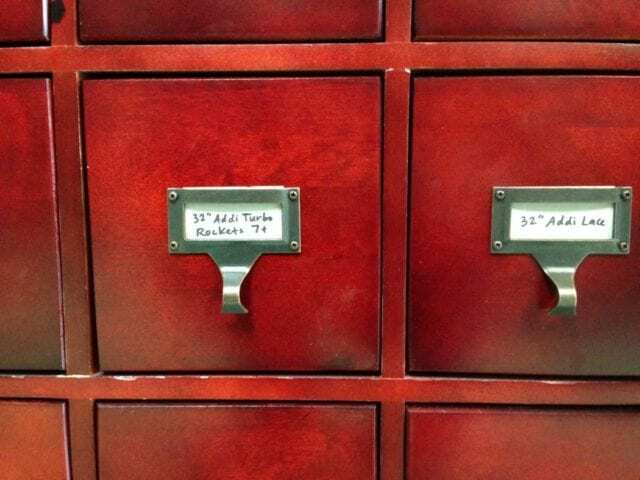 They reside in a chest of drawers reminiscent of a card catalog, sorted first by type and length, then by size. 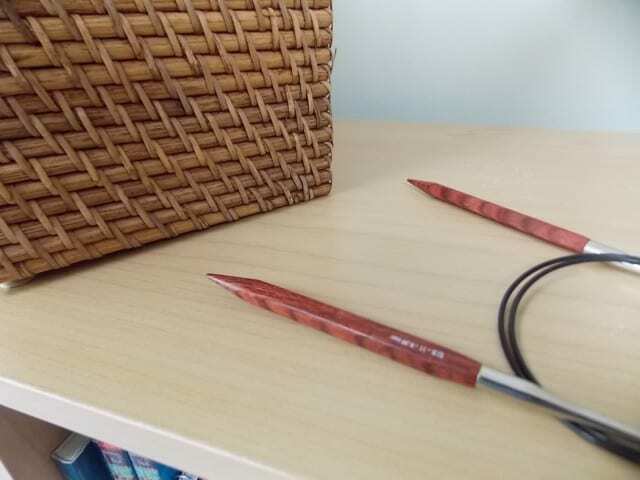 Our wooden needles include Knitter’s Pride Naturalz and Cubics, both made of laminated birch, and some Crystal Palace bamboo needles. 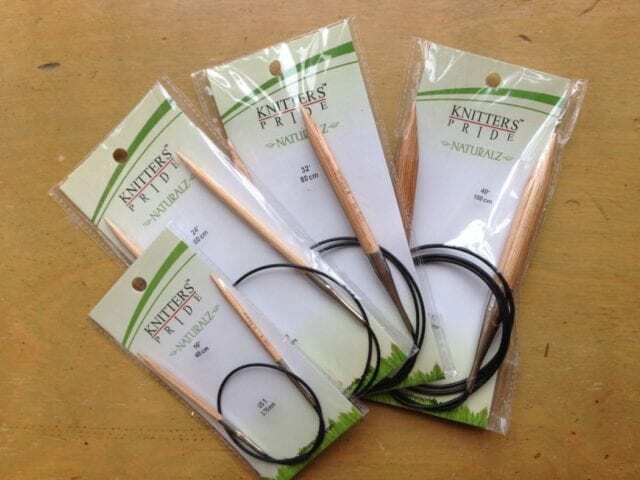 We also stock Knitter’s Pride Karbonz, a graphite needle with nickel-plated brass points. 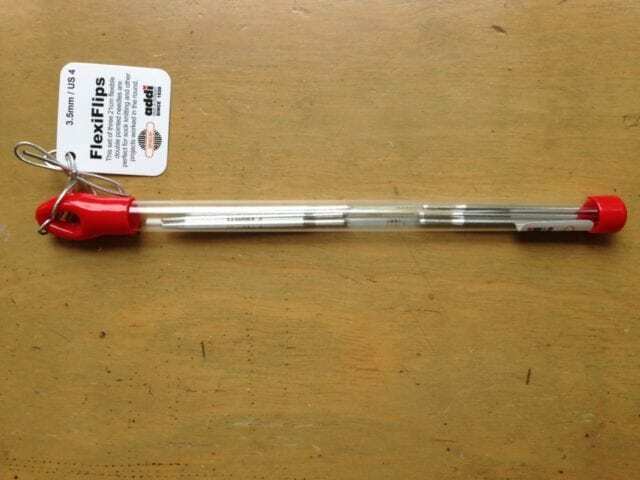 For crochet hooks, we keep Knitter’s Pride Dreamz hooks in stock as well as two types of Addi hooks – straight handled and the ergonomically-designed Swing hooks. Come by the shop for needles and hooks as well as yarn! We’ll happily talk through the options with you, helping to pinpoint which tools are right for your preferences and project. See you at the shop! 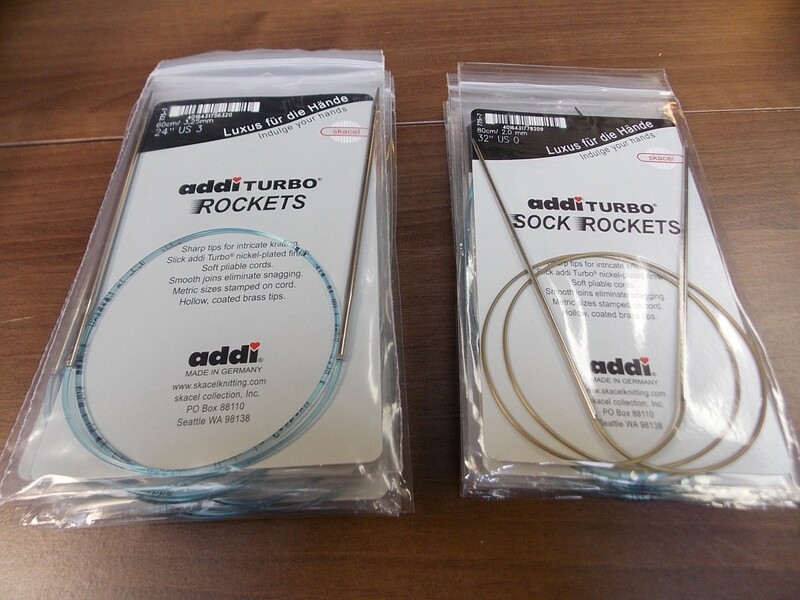 A couple of months ago, we ordered a few sizes and lengths of Addi’s newest circular needle, Addi Turbo Rockets. Lovers of metal knitting needles have always had at least two choices at the Hillsborough Yarn Shop: Addi Turbos, with their slippery finish and blunt tip, or Addi Lace, with their resin-sealed finish and sharp point. Some knitters swear by the Turbos, while others swear by the Lace, and each is appropriate for different fibers and techniques, but the Addi Turbo Rockets meet a need neither of those needles can meet: the slippery Turbo material with the sharp Lace point. When Clara Parkes described them in Knitter’s Review as “the best needles Addi has made to date,” we knew we had to try them. Anne and I have both worked with them now and loved the process, and we’re hearing rave reviews from other knitters, too. So, we ordered some more. 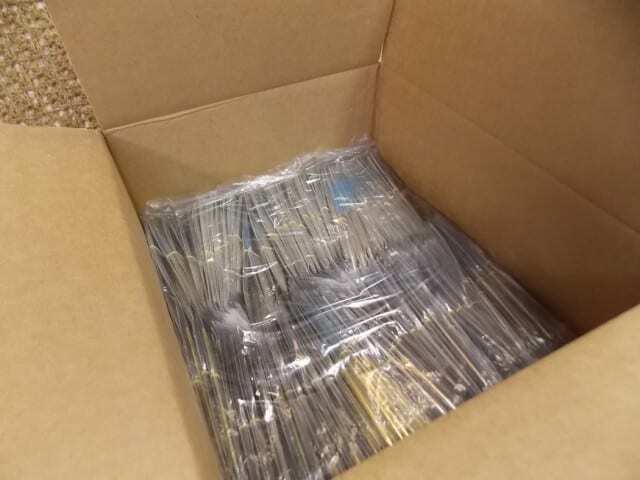 Yep, that’s a box just bursting with Addi Turbo Rockets in 16″, 24″ and 32″ lengths, along with the good old Turbo and Lace needles and a selection of Addi crochet hooks. 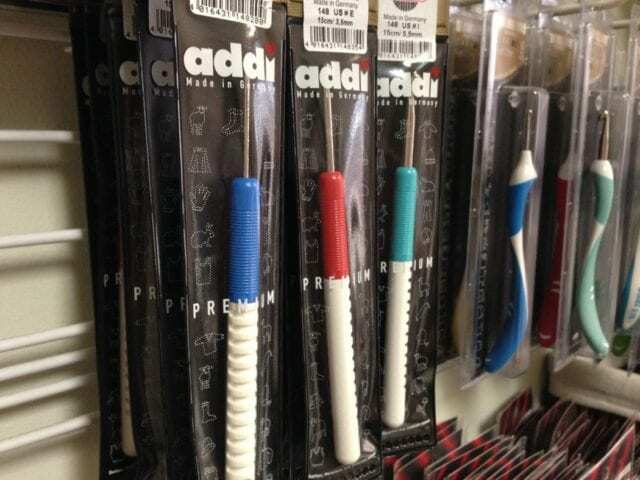 Needles and hooks may not be the most photogenic new item in the shop, but we are serious about keeping all kinds of knitting and crochet tools in stock as best we can. 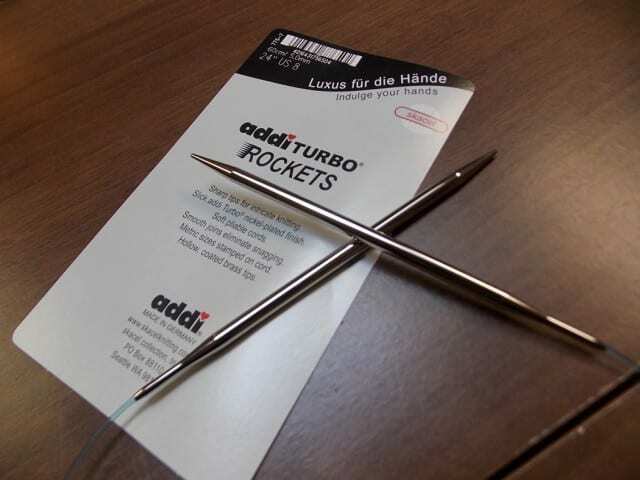 Have you tried the Addi Turbo Rockets yet? Let us know what you think! And if you haven’t, come by the shop and we’ll show you all the Addi varieties and help you choose the best one for your particular project or preferences. See you there! As I’ve written here before, knitters have all kinds of preferences when it comes to needles. Smooth, slippery, pointy, blunt, round or square… there are lots of choices, and we try to have a little bit of everything, knowing that these preferences differ from knitter to knitter and from project to project, depending upon what kinds of techniques or fibers are in use. Addi has recently produced a new kind of needle that meets a need none of our other needles have yet met. Meet Addi Turbo Rockets. We got a small selection of sizes and lengths to start with: for magic loop sock knitters, the Sock Rockets, which are 32″ from point to point, in sizes US 0 to 2; for anyone anxious to try a slick and pointy new needle, the Turbo Rockets, which are 24″ from point to point, in sizes US 3 to 8. Give them a try, and let us know what you think! Knitter’s Pride: Dreamz, Cubics, and Karbonz. 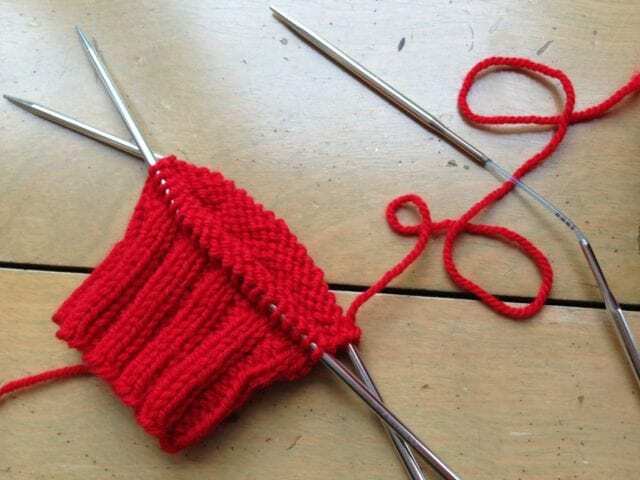 When it comes to needles, knitters have all kinds of opinions and preferences. Some prefer the light weight that wooden needles offer, others like the sturdiness of metal. Some insist on a pointy tip, while others stand by their blunt needles. Everyone seems to agree that in circular needles, the join must be smooth where the needle meets the cord, and the more pliable the cord, the more comfortable the knitting experience. 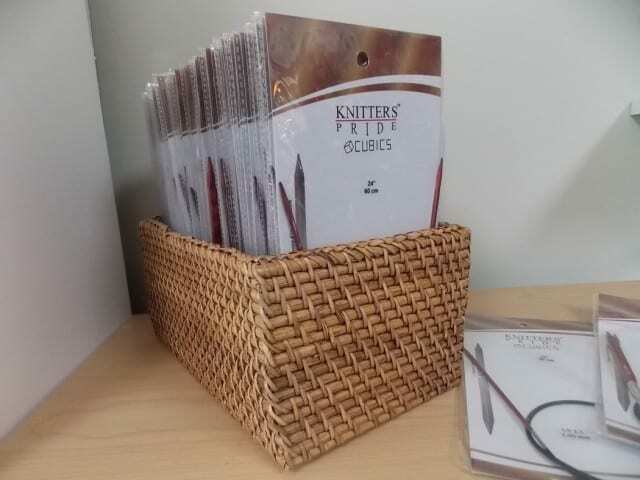 One needle cannot be all things to all knitters, but Knitter’s Pride is a company that offers many different kinds of needles to suit knitters’ many needs. We’ve been keeping three of them in stock: Dreamz, made of laminated birch, Cubics, made in an ergonomically-designed square shape, and Karbonz, made of carbon fiber. This week brought an enormous shipment of all three. Since we first began stocking them, Dreamz have become our best-selling needles. They are pointier than many wooden needles, and less costly, too. We carry 6″ Dreamz double points and circular needles in 16″, 24″, 32″, and 40″ lengths, in sizes from US 0 to 17. 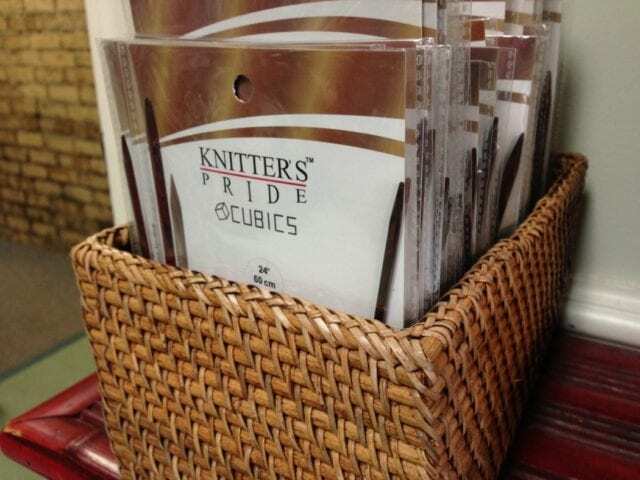 Knitter’s Pride Cubics are also made of laminated birch, but with a square needle shaft rather than round. 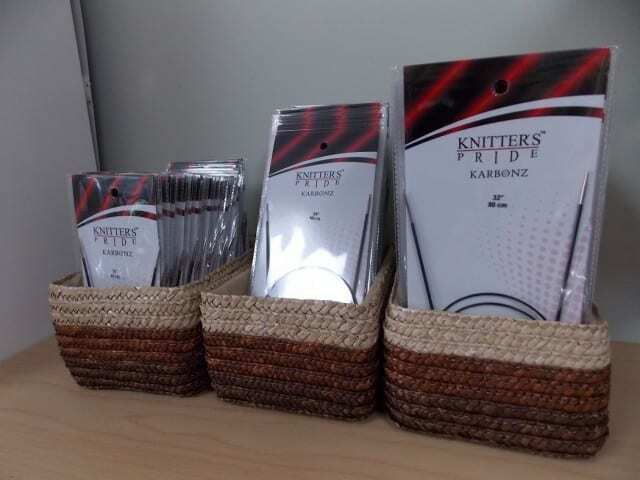 Many knitters have asked us, “What’s the point of square needles?” The answer is that some find it more comfortable than a traditional round needle shaft. While a round needle shaft can roll between your fingers as you hold it, a square needle shaft gives your fingers an edge to rest on, so that you needn’t grip as tightly. Many knitters have said, “Huh, I’ll give it a try,” and many have come back for more. 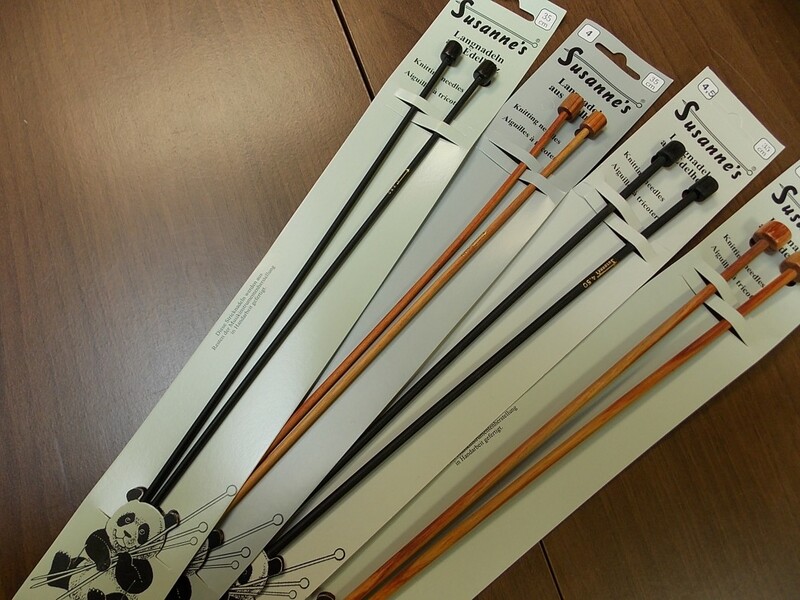 We have Cubics double points in 6″ and 8″, and circular needles in 24″ and 32″ lengths in sizes US 2.5 – 11. Karbonz are the newest of the bunch, and have quickly become quite popular among knitters who appreciate a sharp point and a sturdy needle. Named for the carbon fiber they’re made of, Karbonz are lightweight and warm to the touch like wood, but sturdy and sharp, like metal. Their surface isn’t as slippery as your typical metal needle, either, making them kind of a “best of both worlds,” with positive qualities of both wooden and metal needles. 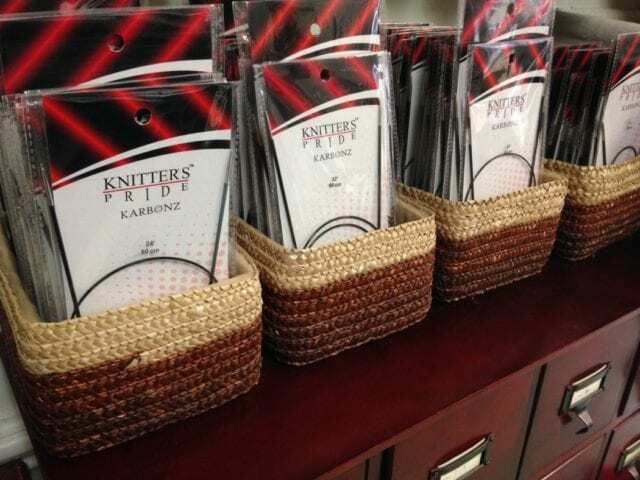 We have Karbonz double points in US sizes 000 – 4, and circular needles in 16″, 24″ and 32″ lengths in a new wider range of sizes–all the way up to US 10! We ordered a few in every size and length, and most have arrived, but a few were backordered; if you’re hunting for a particular size, give us a call and we’ll check our supply. 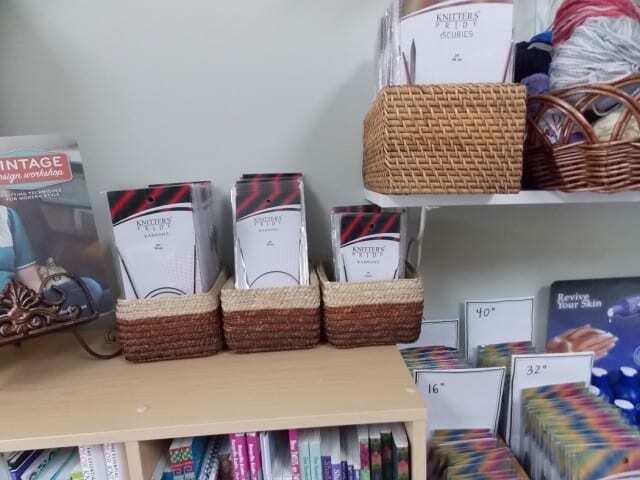 Come by the shop for all the needles you need as well as your yarn. See you there! 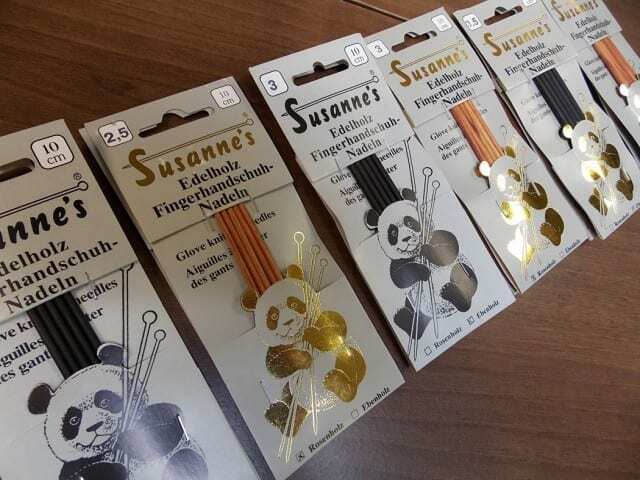 We’ve just taken on a new brand of knitting needles: Susanne’s, out of Germany. 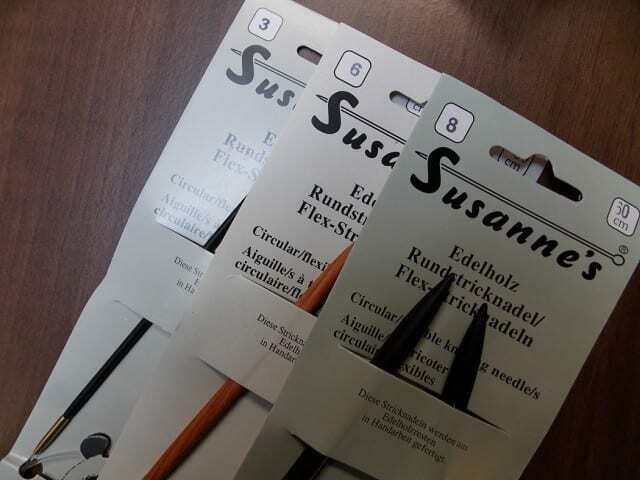 Susanne’s makes beautiful needles from reclaimed ebony and rosewood salvaged from a piano manufacturer. The result is smooth hardwood needles, which come in 13″ straights, 4″ double points, and 24″ and 32″ circulars. I haven’t worked with them yet, but Anne got herself a set of Susanne’s dpns and was thrilled with them, working round and round on a tiny sock. Come by the shop to see them for yourself.